Since it was published in 1991, Annabel Karmel’s essential guide to feeding babies and young children has become a word-of-mouth classic. For 15 years this book has remained the number-one bestselling book on feeding children and it is consistently in the Top 20 Hardback non-fiction titles in the UK – an amazing achievement. A mother of three, Karmel has become a cookbook phenomenon. Her series of home-made recipes for babies and toddlers have sold over 3 million copies worldwide. 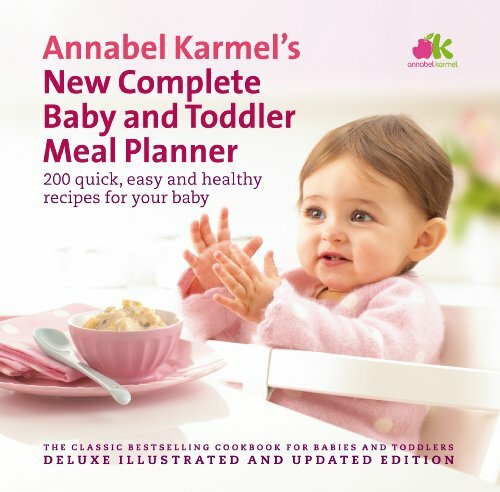 Her Complete Baby and Toddler Meal Planner has become the authoritative guide on feeding babies and children and is regularly in the top five cookery titles. Three new titles have launched this year including You Can Cook, Top 100 Pasta Dishes and Weaning..
Annabel has also recognized that children love to cook & cooking is one of the most important life skills that a child can learn. Annabel is motivating children to cook through nationwide children’s “how to cook-it” courses at Britain’s leading holiday centers, developing a range of branded kids cooking sets including the fabulous Princess baking set, launching a cake mix product as well as her kids cooking books which focus on children cooking up tasty things that they can make and bake. Books are not the only string to Annabel’s bow; she now has ranges for feeding babies and toddlers, food preparation equipment, children’s food, baking and party ware. They can be found on the shelf in supermarkets, pharmacy and specialist baby shops in the UK and Ireland. Annabel’s healthy and nutritious chilled ready meal range ‘Eat Fussy’ for 1 to 4 year olds has quickly become the UK’s favourite with children. Her first food range for babies of sauces and pastas combines fresh with convenience - providing parents with a time saving way to prepare baby food at home with a clever storage system of food cube trays and containers for freezing food for baby. She is also aiming to revolutionise the way children eat in pubs and restaurants and her menus can be found in popular attractions such as Alton Towers, Thorpe Park, Legoland, Chessington World of Adventure, Warwick Castle and Sea Life theme parks as well the UK’s largest Holiday Park group - Haven Holidays and Butlins. And if that’s not enough she has several children’s food lines in development, due to launch this year. Her popular web-site www.annabelkarmel.com has more than 70,000 members. Annabel writes regularly for national newspapers and magazines and also appears frequently on radio and television as the expert on child nutritional issues. She’s worked on a number of series for national TV including the popular "Foodie Godmother" on Channel 4’s Richard and Judy Show, this year’s "Annabel’s Kitchen" on GMTV, Mummy that’s Yummy on Sky and was voted as one of the eight iconic chefs of her generation recently for ITV’s This Morning.